Whether you are hiking for the very first time, or you already know which trails you like the most, and at what times you prefer to go hiking, it’s sure that you take good consideration of your hiking boots. Giving more stability and support than hiking shoes and light weight when comparing to mountaineering boots, a good hiking boot has to fulfill some conditions. A good hiking boot will carry you safe and sound over rough terrain, for a long time, even heavily backpacked. Weather conditions shouldn’t matter much since a good hiking boot is waterproof and breathable. Good ankle support and comfort to your knees are important when you buy hiking shoes. These body parts tend to be more sensitive when you hike. A shank running the length of your foot bed, providing stiffness against rocky and uneven terrain, thus giving you good stability. Nobody wants to go wet when hiking. A good hiking boot will let you jump over puddles, and walk on snowy, icy, slippery paths. The waterproof lining and/or outer water resistant treatment will keep your feet dry. Furthermore, you won’t slip thanks to the technical tread patterns on the hard rubber sole, with deeper and wider spaced lugs that will let you „bite” into rugged terrain. 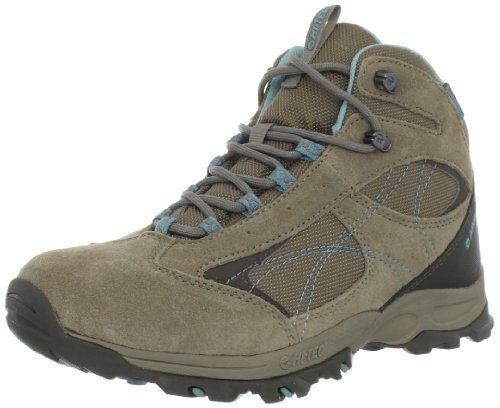 A good hiking boot is not as light as a hiking shoe. Weight makes the difference between these two, among other things. Along with the extra weight of the boots comes though the longer life span, and durability on difficult rocky trails. Of course, a good brand will offer various levels of weight in their hiking boots. You will find lightweight, mid-weight and heavyweight boots. They say the final word on what boots to choose comes from the weight of your backpack and the conditions of your hiking trails. Nope, there is more info when it comes to choosing a good pair of hiking boots. A good brand will create boots for your shorter and faster hikes, meaning lightweight feeling boots, whereas for the overnight hikes, there will be long-lasting comfort boots. 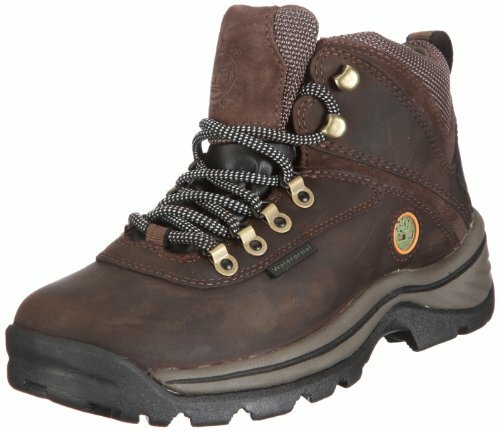 A good hiking boots brand will create ones that are comfortable regardless of trail conditions. These boots will give you good grip when you need one, a warm and waterproof boot when winter hiking, a breathable lining for when your feet tend to sweat, support for your ankles, a good footbed to avoid tiredness, and a toe cap so your toes don’t get blisters. When buying online, you can’t try on your boots. A good manufacturer will either give you a complete and detailed description of their product so you won’t have difficulties to place the right order, or/and they will give you the chance to send back that product for a change if it doesn’t fit. Most hiking boots should also fit a pair of socks, without going a full size up. Depending on your particular arch and width of the foot, you can select your perfect pair. On the market you will find hiking boots made of leather, mesh materials, or fabric. If typically a leather hiking boot needs a break-in period (going from several hours to a couple of days), it’s good to know that a good brand of boots will give you a leather boot with no break-in period necessary. Regardless of your budget and options for a hiking boot, I’ve already given you tips and pointers to allow you to make an educated decision and not buy a lemon. You can go for two pairs of hiking boots (one for the winter hikes, one for the summer ones), or you can pay a little bit more and buy yourself an all year long pair of boots. A good brand will give you a good product for the price. And, since this article is about hiking boot manufacturers, let’s go into some details about each of them, and some of their boot models. Let’s shout their names, then! This brand comes on the 1st place, since their boots are best sellers. Taking good considerations of all the aspects we mentioned so far, this brand puts in the highlights two of the best women’s hiking boots. 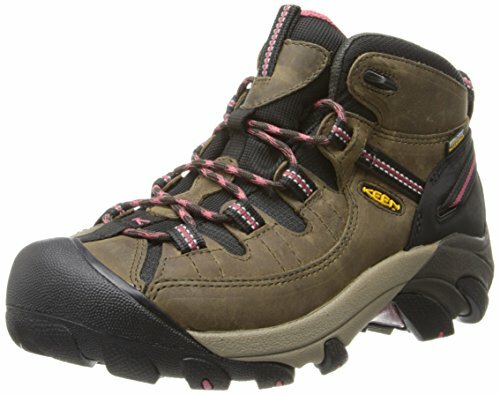 The first of the KEEN boots is the KEEN Women’s Targhee II Mid Waterproof Hiking Boots. These boots stand out from any crowd with their sporty look and a lace-up front. The stitching accents and the bright colors on the laces and around the heel contribute to the nice looks of these boots. Water will not ruin your hikes, since these boots feature a proprietary dry insert. The membrane is waterproof and breathable enough for the entire day. Thanks to the S3 heel support your comfort during difficult hikes on rocky terrain will be preserved. The S3 means that your heel doesn’t feel the shocks from the trails, while also having a good suspension and a great stability, keeping the ankles away from any injuries. Your arch is supported in these boots due to a removable, dual-density EVA footbed that simply hugs the natural shapes of your foot. The compression-molded EVA midsole takes even further the qualities of the footbed, giving you more speed when hiking. 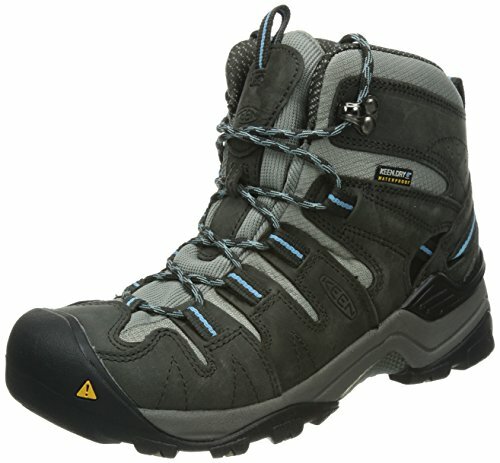 Hiking for a very long time is easy when wearing these boots as they have a torsional-stability shank in the midsole. This shank keeps your feet stable when on the move and reduces foot fatigue. Thinking about the potential variety of your hikes, KEEN provides these hiking boots with 4-mm multi-directional lugs on the non-marking rubber outsole. These lugs are placed wide apart so that you can grip on any rocky, or slippery and uneven surfaces. Not getting any toe blisters is a main concern for any hiker. The patented protection that encases the toes in the Targhee boots along with the outsole provide complete cover of the whole toe bed. This KEEN product reaches the highest standards and even more when it comes to women’s hiking boots. 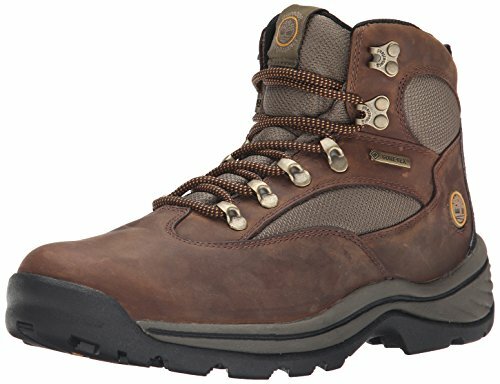 The other KEEN product that sells very well and manages to be different from the Women’s Targhee II Waterproof Hiking Boot, but still very good on so many levels, is the KEEN Women’s Gypsum Mid Hiking Boot. The Gypsum boots are made from leather and textile material and feature most of the qualities of the Targhee boots. The difference is the Gypsum are taller, offering better ankle support. This boot comes with a lightweight, flexible design with strong stitching accents, a sleek shape and a lace-up front. You will fit just nice and discrete in nature thanks to the neutrally colored upper which is yet not boring, due to the pop up color on the laces and around the heel. You will be able to adjust to any change in weather since the Gypsum has a waterproof upper and a Keen lining. The dry waterproof membrane and the Dri-collar simply keep away any moisture and vapor, protecting against bad odors also. Many features of this KEEN product offer you awesome support throughout the entire day: the dual-density, compression-molded EVA midsole, the removable Keen Metatomical EVA footbed, and the Keen Zorb Strobel (funny name for the full length, foam-based cushioning layer) all contribute to give you a comfortable feeling from the very first hike. You can take long hikes with these boots. Their TPU shank keeps away fatigue and gives your feet comfort. This boot also features the S3 heel support (Shock, Suspension and Stability) and the multi-directional lugs for great traction. No toe will get injured thanks to the patented toe protection that covers the entire toe room. The shaft of the Targhee II boots measures 3.5” from the arch, and the shaft of the Gypsum boots is 5”, while their weight is almost the same. 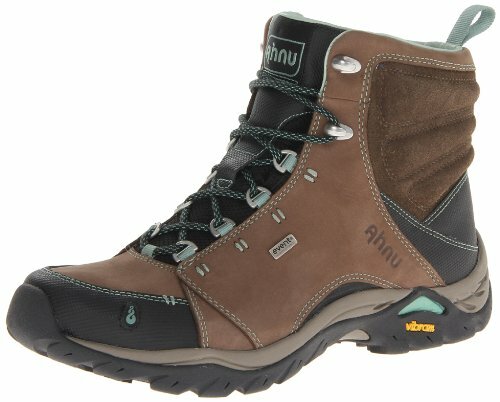 The AHNU brand comes under our radar with two of its best products on the market, but there are other Ahnu boots that also sell very well. The Ahnu Women’s Montara Boot is made from leather, is imported and convinced the customers by being flexible on all kinds of trails, offering the best comfort at the same time. With a synthetic sole, these boots will maintain your feet dry, since the bootie is waterproof and breathable. The padded collar with eVent breathability gives you both stability, support when hiking and keeps fatigue away. Even though these boots need a break-in period (some customers complained about some blisters), they have a rubber toe protector that takes care of the toes once the boots have broken in. These boots have a shaft of 5” from arch and a 1.25” heel. 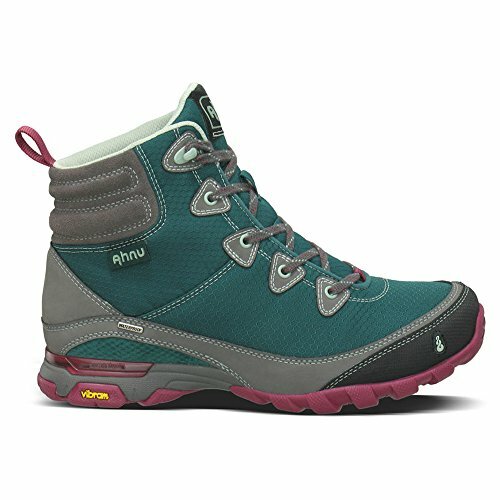 The Ahnu Women’s Sugarpine Hiking Boots have a shaft of 5.5” from arch and only 1” at the heel. These boots aren’t made from leather, but from synthetic fabric, and so they are light, while still being very good quality. Very comfortable and roomy, these boots will give you support no matter the difficulty of your trail. Lightweight and molded to the foot, these boots manage to remain sturdy even when your trail gets rocky and slippery. No mud, no streams will mess up your socks and feet since these boots are waterproof. The secure lace-up vamp and the cushy padded collar with pull-on loop ease up your hike from the minute you put these boots on. The beautiful 8 color combinations will convince you that your hikes don’t just need to be long and tiresome but feeling light and fun too! 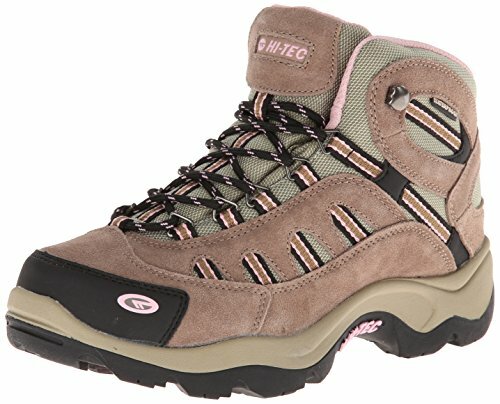 The HI-TEC brand comes with the most affordable women’s hiking boots, while keeping a very close eye on quality. 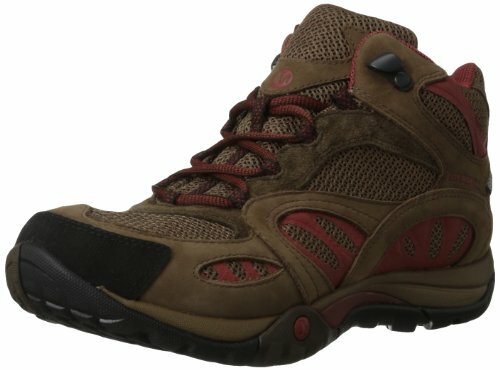 The first model I’m presenting, the Hi-Tec Women’s Ohio WP Hiking Boots are made of leather and fabric and need some time to break in. They come with a non-marking rubber sole and the versatile lacing system makes them sturdy, and yet nice looking. The moisture-wicking lining and waterproof treatment will let you walk on wet terrain and through streams, not worrying about water getting to your feet. The padded collar and tongue will add more comfort to your longer hikes, whereas the removable EVA insole will make caring for the boots easier. These boots come in nice neutral colors, and have a shaft of 4.75” from arch and a 1” heel. On the other hand, the Hi-Tec Women’s Bandera Mid-Rise Waterproof Hiking Boots come with a man-made sole, whereas their shaft is 5” from arch and their heel goes around 1.25”. Leather and fabric were used alongside in the making of these boots and their platform is around 1” tall. True to size, keep in mind that, as always, the width of your foot has the final word. Some owners wear warm woolen socks in these boots and still find them perfect, while others find them too narrow even without socks. Mid-rise, these boots are waterproof and have multiple layers of suede that features a padded topline. Your comfort will increase due to the webbing straps on the sides and there will be no rust in time, since the lacing hardware is rust-proof. The removable, contoured EVA sock liner and the compression-molded EVA midsole simply add more comfort to your feet when hiking. You may hike as hard as you want with these boots; the multi-directional traction outsole will ease up all your efforts! The tradition in good manufacturing is seen in these two Timberland products that, above everything, stand out by their quality and durability. The Timberland Women’s White Ledge Hiking Boots are made of leather and they will need some time to break in. On the other hand, they will stick around for a very long time as your all-season hiking boots. You get great traction on your trails thanks to the rubber outsole of these boots and no water will disturb your hike. The premium full-grain leather upper is waterproof and the seam-sealed construction is also keeping your feet dry no matter what the weather conditions. The moisture-wicking textile lining plays an additional role in keeping your feet comfy and dry. Yet more comfort comes from the padded collar and tongue and the external heel covering that gives rear foot protection. The well placed lugs will ease up your traction and the rubber outsole will give you stability when hiking on rocky, slippery trails. The Timberland Women’s Chocorua Trail Boot differs from the White Ledge boots on some levels, but sticks to the high standards of high quality. Made of leather and textile, these boots feel light weight and need no break-in period. With a great fit and looking nice on your feet, these boots have a 4.5” shaft from arch and a 1.25” heel. Their platform is around 4.5” wide. The rubber sole and the EVA midsole will make you feel comfortable and the efficient lug system on the outsole will help speed up your hike. The Gore-tex membrane and seam-sealed construction for waterproof protection allows you to step into puddles and streams and to not be afraid of rain! This last manufacturer comes with two options; they differ by price (different materials), and maintain a quality comparable to any other boots presented here. The Merrell Women’s Azura Mid Waterproof Hiking Boot are made of leather and come with a synthetic sole. Needing a shorter than anticipated period to break in, they have a waterproof membrane and an odor control tech. Your comfort will forever be ensured thanks to the Ecor Right Lazy Foam footbed with Merrell Remember Me memory foam. The Merrell air cushion heel will add to that also. The bellows tongue will keep debris out and these boots give great comfort for light trails, no matter how (in)experienced you are! 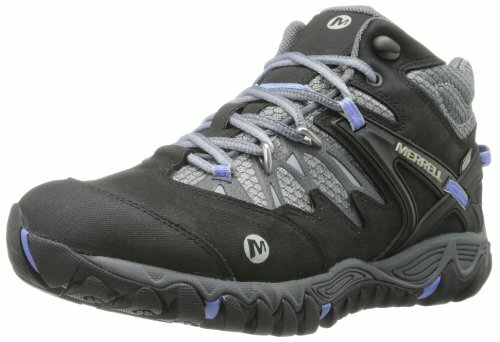 The Merrell Women’s All Out Blaze Mid-Rise Hiking Boot come as a very flexible option. Made from leather, and synthetic fabric, they feature a Vibram sole for improved shock absorption, and have a 6” shaft from the arch. These boots also have a mesh upper, with leather overlays and the Omni-fit lacing system secure the boots on your feet. Breathable and waterproof protection come in a package with these boots and the soft E-Foam midsole disperses impact, thus giving you more comfort when rock hiking. The Vibram outsole brings added traction and support, and you’ll make a good investment of your money buying these boots.